If your horse is acting up or out of control is it safer to fall off or do an emergency dismount? It will depend on the situation. Sometimes things happen so suddenly you don’t have a choice. Some experts claim doing an emergency dismount might cause more problems than falling off. But there are times when bailng out may be the better option. If your horse is heading towards a low branch, a busy roadway, or heading for a low doorway, you may be better off parting company. That way, you aren't at risk of being swept off or hit by a highway vehicle. Like all riding skills, learning to do an emergency dismount requires practice, and it's not entirely without risk even in a controlled situation. If you lose your balance as you land, for example, you do risk hitting the dirt and ending up with some bumps and bruises. Take things slowly as you learn, and get the help of a coach, rather than trying to attempt this by yourself. Note: Not all riders are skilled enough to do an emergency dismount, and this dismount may not be effective in all situations. Whether you decide to do an emergency dismount or stay with the horse there will always be some risk of injury. Riding a horse is always risky, and riding at speed increases the risk. 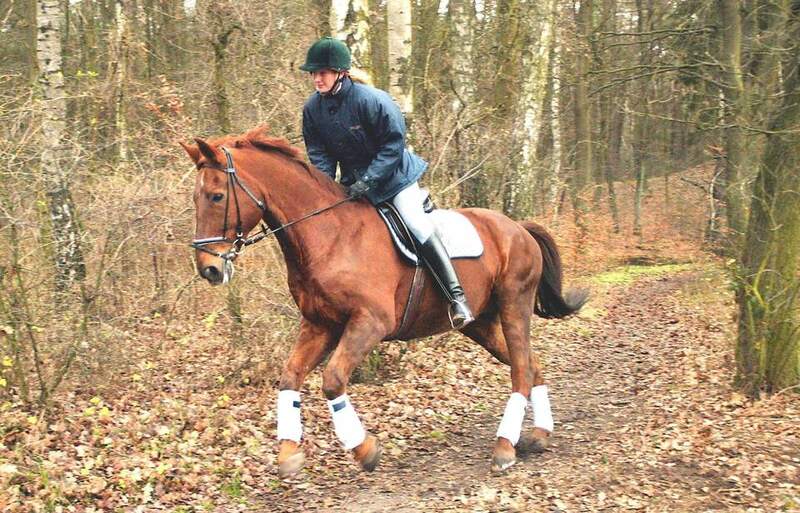 A safe area such as a riding ring or arena, where the horse can't get away, with good footing. Your instructor or another knowledgeable person. A helmet and safe boots or stirrups. A torso protector is also a good idea. Take both feet out of the stirrups. This is essential. Drop the reins. You can throw them up on the horse's neck to get them out of the way. Put both hands on the horse's withers or low on the horse's neck. Lean your weight onto your hands. Swing your legs forward, then back, as you lean on your hands. This gives you momentum to lift yourself out of the saddle. Don’t swing your legs too far forward, you just want to build momentum to swing your legs clear of the horse’s haunches and the cantle of the saddle. Using your horse’s neck or withers as a pivot point, vault off, swinging one leg over the horse as if dismounting (but with much more energy) and push away from your horse. You will probably feel the most comfortable vaulting off the near side but practice on the off side too. Land on your feet, and bend your knees as you land to absorb the shock of landing and help keep your balance. If you lose your balance, roll away from the horse. Practice emergency dismounts at a standstill, a walk, and then a trot. If you are very agile, you can try it at the canter and gallop. Tie the reins out of the way during practice dismounts so you don't accidentally pull on the horse's mouth or the horse doesn't accidentally step through them when you are dismounted. If you hang onto the reins during an emergency dismount you might lose your balance, pull the horse towards you, and get stepped on.